Days shorten, children sicken, schools close and meetings pile up. Promises made, deadlines pass, apologies offered. I wonder where the days have gone. Interviews completed, orders filled, deliveries made. Opportunities arise, boxes packed, bookshelves moved, all is good. Sometimes, what I need most of all is a few moments of quiet followed by a little perspective. It has been such a busy fall it is hard to prioritize the excitement. SpiderFelt has moved down the hall at BallardWorks to studio 2D. I’m sharing a beautiful space with fellow feltmaker Linda Kjarstad. We have twice the space, twice the light and twice the fun. If only there was a way to capture the feeling of working with golden sunshine streaming on my shoulders; it makes the most monotonous work enjoyable. With these new digs, we will be able to teach classes and host workshops with lots of elbow room to spare. Come see the new work we’ve been creating and start your holiday shopping by supporting local artists. There were several large wholesale orders for felt soaps and kits that kept me in production mode in September and October. But just in time for tomorrow’s open studio, I finished a pair of new nunofelt vests or wraps, depending on how you wear them. 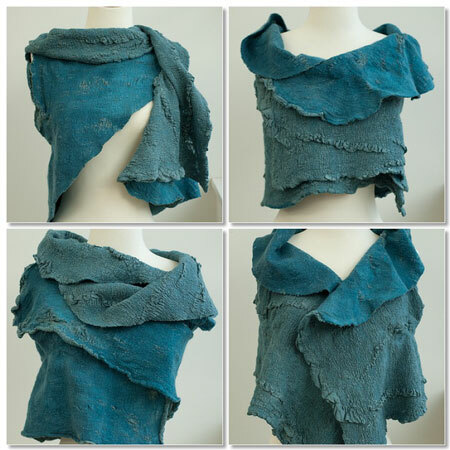 Out of the blue, I was interviewed for an article about felting that ran on the AP newswire, which means it was published in various newspapers across the country and will continue to run for the rest of November. It was enjoyable to speak at length about a subject that soothes and excites me every day. The author, Jennifer Forker, did an excellent job providing an overview of the various types of felting. Unfortunately, this will be our last artwalk for 2011 as the building will not be open for the December artwalk. BallardWorks is located at 2856 NW Market St. We hope to see you tomorrow night.